Kurlee Belle: Happy Now? Gabby Douglas' hair is styled. Gabriel "Gabby" Douglas is the first African-American woman to win an Olympic gold medal in the individual all-around gymnastics competition and the first American gymnast to win the gold in a team and all-around competitions. What more do you want from her? It is shameful that many people in the African American community have overshadowed Gabby's success by criticizing her hair. Yes, she was on television for the entire world to see, but people there is more to life than hair and there is definitely more to life than appearances. 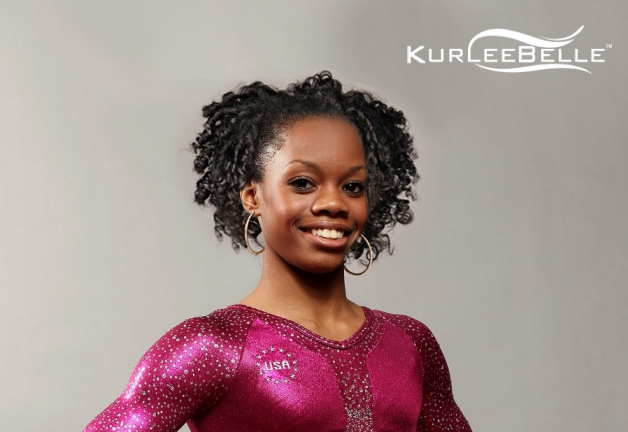 All this chatter around "Gabby Douglas gotta do something with this hair! These clips and this brown gel residue aint it” and “Gabby Douglas needs to tame the beady beads in the back of her hair." is unnecessary and just highlights how shallow and superficial many of us are. How about focusing more on fitness than hair. There are thousands of African Americans suffering from illnesses brought on my poor diets and lack of exercise. Many women are constricted by their hair refusing to swim or exercise because of the effect it may have on their hair. What were you doing when Gabby was practicing for the Olympics? Sitting on the couch eating a bag of Cheetos, while looking up the latest natural hair YouTube video? Your hair looks great, but your dying from poor lifestyle choices? You don't want to exercise because you don't want to sweat out your perm or wear a headscarf to the gym?Would you prefer to be in shape like Gabby Douglas or have a killer blow out or twist out? For decades we have forgone extracurricular activities like swimming, camping and hiking because we just can't get our hair messed up. Although many of us have joined #teamnatural, we still have a defeatist attitude where what we do is controlled by our hair. If Gabby were like the average woman she may not have won two gold metals because she would be too concerned that all that flipping, jumping and sweating may interfere with her hair. Many Olympic female athletes wear their hair in ponytails with clips. Why are we only focusing on Gabby? We praise those crazy Basketball Wives and Love & Hip Hop reality stars because they wear Louboutins with weaves down to their backsides-paid for by laying on their back. But we criticize a woman who is magnificent and made her country proud because of her passion for a sport? Not every woman is going to be a glamour girl, we just need to accept that. It is OK to be who you are, flaws and all. Let's stop all this negativity and give Gabby the praise and recognition she deserves. In the words of Gabby: "What's wrong with my hair? I'm like, 'I just made history and people are focused on my hair?' It can be bald or short; it doesn't matter about [my] hair." To all the Gabby Hair Haters "KISS MY KURLS". 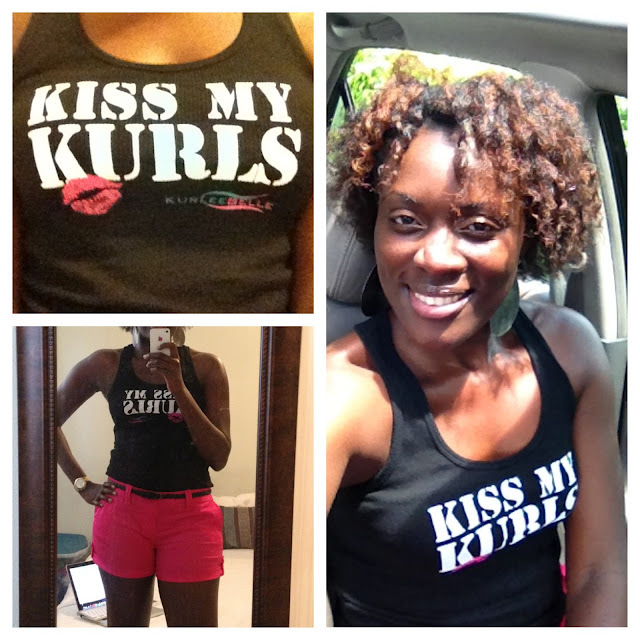 Read the story behind our "Kiss My Kurls" Tank! Click here. Come on Ladies it's just hair. Honestly I never even paid attention to her hair before all of this and I think it's a shame that so much focus went toward that. She looks adorable in that picture, but it hurts my heart that she would even have to or want to do that because of the negative publicity. When I saw pictures of her in the magazine ads I thought she was adorable then and maybe somewhere in the back of my head I think I noticed her hair. My main thought was, "Wow, look at her with those little white girls (LOL!)... I wonder if my younger children will ever have aspirations like this and if I can do what it takes to help them get there." I hope Gabby hears and sees the positive support for her and the folks who could care less about her hair. We are proud of her, amazed and encouraged by her, and we support her with all we have within us.